A Beechcraft 300LW Super King Air, registered LV-WLT, was destroyed when it impacted two houses in the La Isla neighbourhood of Nordelta, Argentina. A fire erupted in both houses and both occupants of the airplane sustained fatal injuries. The aircraft was piloted by the former owner of the now defunct airline LAPA. The aircraft departed Estancia La Nueva Airstrip about 14:34 LT on a 40-minute IFR flight to Buenos Aires-Jorge Newbery Airport. 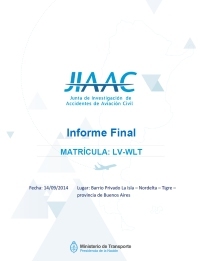 At 14:45, at the request of the pilot, the aircraft was authorized direct to the VANAR point, which is on the approach path for runway 13 of Jorge Newbery Airport. The aircraft crossed the extended centreline of the approach path almost perpendicular, 6.4 NM northwest of VANAR. The pilot was authorized to intercept the instrument landing system (ILS) locator of runway 13 and to descend to 2500 ft. At 15:10 LV-WLT started a right turn with a ground speed of 260 kt, stopping the turn with a 204° course. This course implied that the aircraft would intercept the locator axis with an angle greater than 70°. In this position, the indicated airspeed / IAS of the aircraft should have been set at 200 kt IAS or lower to allow flap extension for approach, in accordance with the information in the BE 300 flight manual. Due to the magnitude of the intercept angle and the velocity above that established for the flight condition, LV-WLT exceeded the locator axis. The aircraft then started a turn to the left setting a course to intercept the locator at an angle of approximately 90°, and a ground speed observed on the radar of 228 kt. The combination of the magnitude of the interception angle and velocity, meant that the locator axis was exceeded again. The Newbery Tower controller warned the pilot and offered help to bring him closer to the approach path. The pilot replied "... we are intercepting", starting a turn to the right. Nineteen seconds later the aircraft struck three homes in the La Isla neighborhood of the Nordelta complex, Tigre, province of Buenos Aires, with an approximate course of 155°, disintegrating on impact and catching fire. The impact on a street occurred with an angle of its horizontal axis of approximately 45° and with a lateral slope to the right of approximately 60°. After the initial impact and as a consequence of its kinetic energy, the aircraft rebounded and impacted a house. Distance from Estancia La Nueva Airstrip, BA to Buenos Aires-Jorge Newbery Airport, BA as the crow flies is 266 km (166 miles).